I rarely share anything personal on my blog and usually keep my life beyond clothes behind the scenes but feel this is a topic that I want to be open about. It is so easy to only highlight the perfect moments and positive experiences on social media and it leaves a common misconception that that's reality. Given my experience, maybe opening up about our struggles and frustrations might help someone who is struggling with the same feelings or at least show that there is more beyond the curated content we choose to share. While I still believe our journey to get pregnant was smooth compared to other stories I’ve heard, I have learned that comparing your pain to another’s is never the way to cope with your feelings. Deciding to start a family is a huge, life changing decision, and as someone who likes a plan and likes to have control, I never expected the roller coaster of emotions that come with this decision. We are at the time in our lives where all of our family, friends, and network of co-workers and acquaintances, are starting families and all around us we were hearing ‘it only took one try!’ or ‘we weren’t even trying!’ Here we were 8 months in still seeing negative pregnancy tests. Most doctors will tell you it can take up to a year but as many times as you hear it, it doesn’t help calm the fears that maybe it will take longer or maybe it won’t happen at all. ‘Everything happens for a reason’ and ‘What’s meant to be will be’ are phrases I have always struggled with. I do believe that most of the decisions I’ve made in my life have been purposeful and have lead me to where I am but also believe that some decisions that were out of my control probably worked out for the best. This experience was a perfect example of when it was not only in my best interest to not have control, but it was impossible for me to have any control at all. No matter how much we researched, how much we followed the ‘rules,’ this is one thing in my life I had little control over. In fact, the more I stressed about the situation, the further I was putting myself from what I wanted. The moment I let go of control and let go of the fact that I could not single-handedly change the outcome, we finally saw two pink lines. 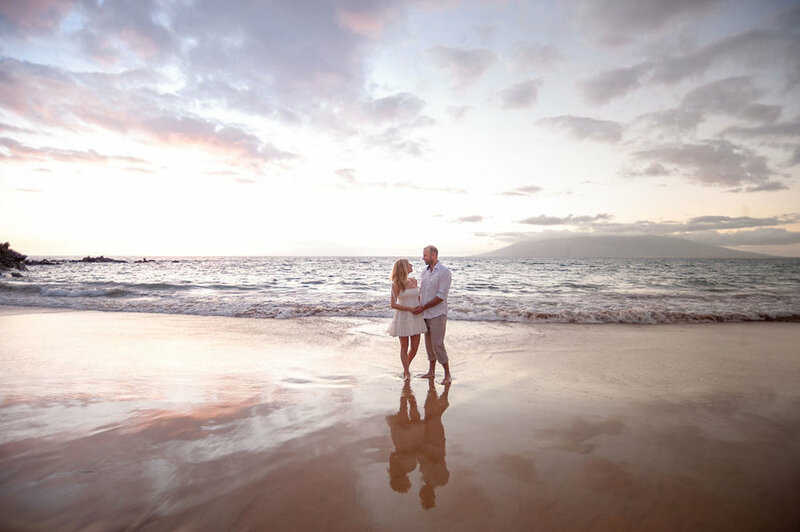 When we booked our trip to Hawaii, we had no idea it would turn into a ‘babymoon.’ So maybe everything does happen for a reason. We were so happy to be able to celebrate this amazing news and to work with Amity Mason Photography to document a special time in our lives in one of our favorite places. We celebrated our honeymoon in Maui almost 5 years ago and returned a year and a half later because we loved it so much. To be back this past March, celebrating another milestone, we couldn’t be happier or more grateful for this blessing.